Electrification or the process of providing access to electricity is a critical input for socio-economic welfare and development of disadvantaged regions, given its impact on multiple domains like education, health and connectivity. For instance, access to modern energy sources facilitates higher agricultural productivity and better educational outcomes, thereby acting as a tool for income generation and poverty alleviation. Electricity enhances all-round quality of life, by mitigating indoor air pollution from inefficient fuels and eliminating the considerable time and labour involved in gathering wood and biomass for fuel. It is in recognition of this that electrification is at the centre of development policy efforts in a number of developing countries. Given the central role that electrification plays in facilitating socio-economic development, it is imperative to understand where we stand in terms of electrification rates today, and review the progress that has been made both globally as well as by individual regions/countries. Universal access to electricity or energy was not included within the Millennium Development Goals, leading the Brookings Institution to term it the “missing MDG”. Access to Energy also had direct implications for MDG 1, “to eradicate extreme poverty and hunger” and MDG 7, “to ensure environmental sustainability”. This was rectified in the Sustainable Development Goals, with SDG 7.1, “By 2030 ensure universal access to affordable, reliable and modern energy.” The monitoring of 7.1 involves two indicators, the first of which is proportion of population with access to electricity. In order to assess the movement of countries towards this ‘universal access’, the World Bank and Sustainable Energy for All (SE4ALL) began monitoring countries’ individual electrification rates in 1990 and maintain a global dataset on ‘Access to Electricity’. Though many of the countries have achieved or are nearing to achieve 100 percent of electrification in 2016, large swathes of Africa and sections of Southeast Asia are struggling to accomplish this goal. Thus, to understand the progress undertaken to achieve complete electrification, this article/note analyses the countries that have made greatest advancement over the last three decades..
At the global level, ‘access to electricity’ as a percentage of households advanced from 71.6 percent in 1990 to 87.35 percent in 2016, an increase of roughly 16 percent. The gains occurred smoothly for the most part, averaging around half a percentage point each year. While the big picture was relatively consistent, individual countries experienced gains in a much more uneven manner. Out of the 196 distinct countries included in the World Bank’s data set, the numbers which reported electrification rates of 100 percent and those which crossed 80% illustrate this point (as shown in Figure 2). Between 1990 and 2016, there were efforts to drastically expand access to electricity in many countries and bring them as close to universal access or total electrification (100 percent) as possible. The number of countries with a 100 percent electrification rate remained constant through the first decade under observation before nearly doubling between 2000 and 2016. By 2016, more than half of all countries had reached total electrification. Those countries which had made large strides but were shortly behind i.e. those that had crossed 80 percent rose across all decades though they too increased sharply in the 2000- 2015 period. By 2016, over two-thirds of countries had crossed 80 percent electrification. Though the increase in electrification seemed modest in percentage terms or in terms of annual growth, it represented significantly expanded opportunities for many people around the world. The movement in the world average can be ascribed to certain regions, and is not a uniform increase across the board. As North America and Europe and Central Asia had already reached 100 percent by 1990, the bulk of movement occurred in Sub-Saharan Africa and South Asia (Figure 3). 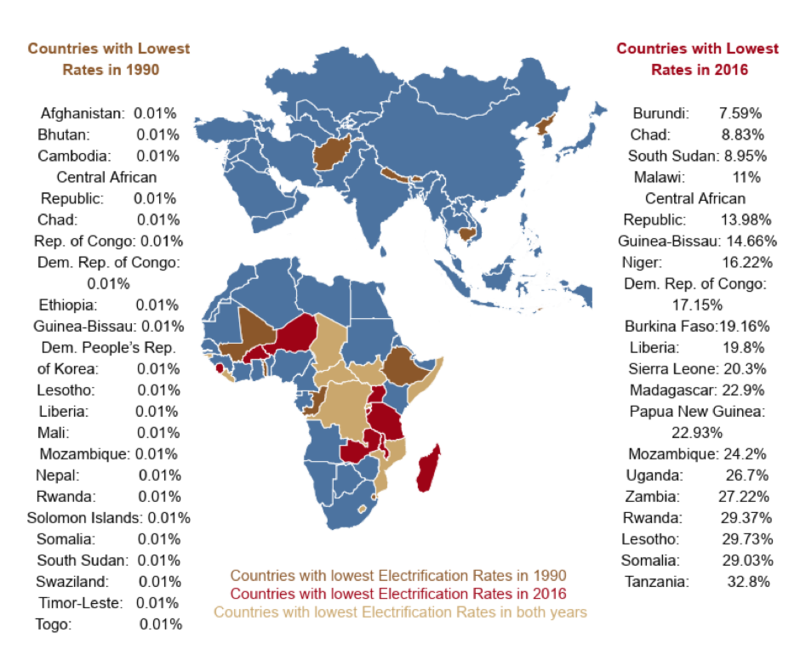 In these regions, one method to assess what had changed between 1990 and 2016 was to examine which countries had the lowest rates of electrification and how much variation existed among them. In 1990, the countries with poorest access to electricity were spread from Africa to Southeast Asia. Of the 22 countries which reported the lowest rates, all of them had the same rates with 0.01 percent. These countries are highlighted in dark and light brown within the map in Figure 4. By 2016, almost all of the countries in Asia had increased their electrification rate rapidly and no longer figured within this category (with the single exception of Papua New Guinea). Further, Burundi, a country in Africa, which had narrowly missed the 1990 list with 0.34 percent electrification, was now the country with the lowest electrification rate, at 7.59 percent. However, the list of the 20 nations with lowest access to electricity in 2016 ranged from 7 percent to 33 percent. These were largely concentrated in central and eastern Africa and are depicted in light brown and red on the map. It is interesting to note that ten countries (shown in light brown) appear on this list in both years. Therefore, in terms of electrification rates, these countries represent the largest remaining challenge to universal access to electricity: Central African Republic, Chad, the Democratic Republic of Congo, Guinea-Bissau, Lesotho, Liberia, Mozambique, Rwanda, Somalia and South Sudan. While examining electrification globally, it is essential to take a closer look at countries that have improved the most in terms of share of population with access to electricity. 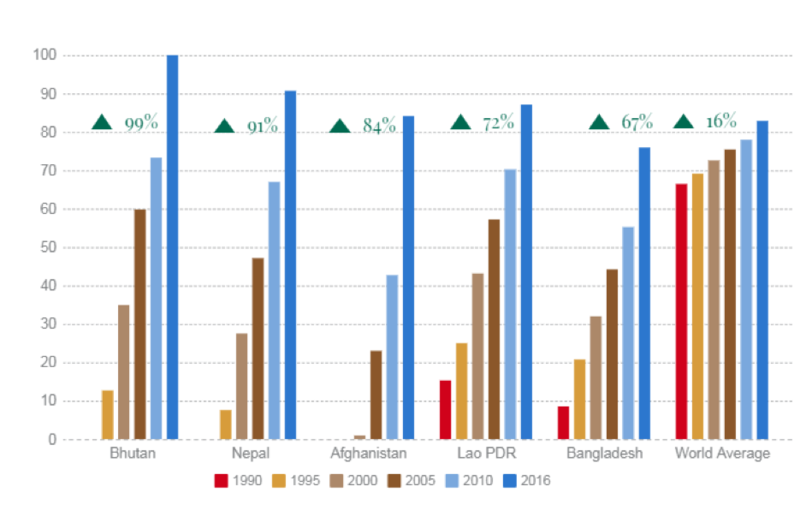 Four of the five countries that achieved the major advancement are situated in South Asian region – Bhutan, Nepal, Afghanistan and Bangladesh, with Laos wrapping up the top 5. The trajectory of electrification in these countries has been placed alongside the global average electrification rates through the same periods, so as to highlight the scale of achievement. The countries that made the most progress in percentage terms however are not necessarily the same as those that saw improved access to electricity for the greatest number of people. Smaller or more densely populated nations could increase the rate of electrification more easily than those more broadly spread out. For the latter category, the technical and infrastructural needs for universal access to electricity were much broader. This underlies the scope of energy improvements made in India with a vast rural population, Indonesia which comprises over 900 permanently inhabited islands and Brazil, with over six lakh households located in the Amazon rainforest. 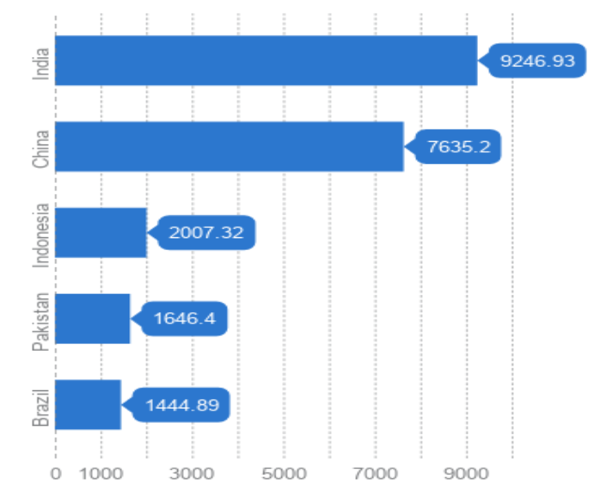 This is represented in Figure 6, which shows the top five countries in terms of absolute number of people who gained access to electricity between 1990 and 2016. India has the single largest increase with 9246.93 lakh people who gained access and is closely followed by China. This graph highlights the sheer scope of improvements made under energy initiatives in India which has the largest rural population in the world, Indonesia which comprises over 900 permanently inhabited islands and Brazil, with over six lakh households located in the Amazon rainforest. In India, Electrification received attention in a continuum of schemes run by the Ministry of Power and supported by the Rural Electrification Corporation. To address the electrification deficit in rural areas, these schemes promoted public sector investments and upgrades to existing infrastructure. In Brazil, the ‘Luz para Todos’ or ‘Light for All’ scheme also included federal subsidies to pay for electricity consumed by low-income families and targets for renewable energy as a share of total electricity consumed. In Brazil, as in India, a large portion of the funding was provided domestically. Given how critical modern sources of energy are to socio-economic welfare, the lack of access to electricity is an indicator of deprivation that requires immediate attention. In this context, the massive improvements that countries and even whole regions have made with regard to electrification are cause for optimism. However, it is worrying to note that a number of countries that performed very poorly in 1990 continue to do so in 2016. Going ahead, the focus must be on replicating the successful practice of countries like Bhutan, India and Brazil through the provision of financial and technical support to frame and implement similar policy initiatives by the Central/State Governments of the respective countries. https://www.brookings.edu/blog/up-front/2010/09/16/universal-energy-access-linking-the-mdgs-to-global-climate-negotiations/, as accessed on June 18, 2018.
 http://www.who.int/topics/millennium_development_goals/about/en/, as accessed on June 18, 2018.